This Essteele Per Vita 28cm/5.2L Covered Saute is a pleasure to cook with thanks to the solid copper that is spread across the induction suitable base, allowing heat to disperse evenly and quickly. This results in optimum heat control and perfect cooking conditions favoured by the most discerning cooks. The Per Vita collection combines Italian elegance with a 60 year Australian heritage, bringing you flawless, beautuful looking cookware that continually performs. Essteele Per Vita 28cm/5.2L Sauteuse is rated 4.9 out of 5 by 10. Rated 5 out of 5 by my3sons from Perfect size for family of 5 I needed a bigger pan to cook with to feed my family and this is perfect! I have other products from the same range and as expected the quality is awesome. Rated 5 out of 5 by polarbear from A joy to cook with! I never realised what a difference a good saucepan, the right saucepan, could make! This size is so versatile, I use it to sauté, cook risotto, curry, etc. and it’s deep enough to cook stews or anything requiring a substantial amount of liquid. So nice the handles stay cool to touch, and the even heat distribution means no hot spots and food ‘catching’, which means easy cleanup. Looks good too! Rated 5 out of 5 by BrittCooks27 from Beautiful and classic design Purchased this several weeks ago and it's been in constant use in our kitchen. The design is beautiful, and it feels very high quality and functional. I've babied it a little and not put it through the dishwasher, but it's been easy to hand wash. I look forward to purchasing more Esteele items as we upgrade our kitchen tools. Rated 5 out of 5 by BB1062 from Much coveted sautepan A friend's son has been openly lusting after my Essteele sautepan, so his father and I chipped in to buy him his own for his 32nd birthday. It will provide a lifetime's enjoyment and good meals. Rated 5 out of 5 by eccles08 from Croation cooking I bought this a week ago and it arrive in only 2 days I was so excited best delivery ever as I live in the country. After needing something larger to cook my gnocchi in and for making my sauce. I also wanted to be able to put it in the oven. I was looking for stainless Steele and the copper base heats up lovely. Great price while the sale is on. A very smart pan, and made in Italy you get quality. 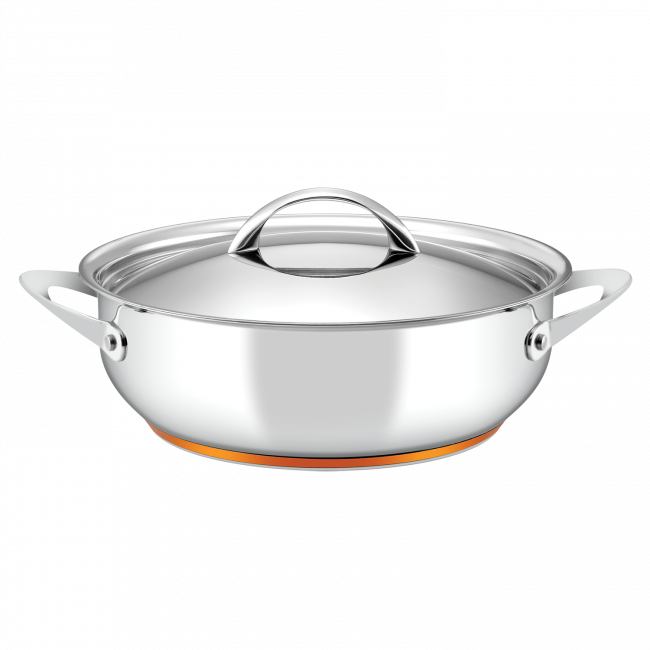 Rated 5 out of 5 by kate from 28cm/5.2L Sauteuse I love it so much. I have had my other Esteele saucepans for almost 30 years. You wont better quality pans. They are the best ever.